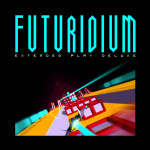 Futuridium EP Deluxe is a solid and enjoyable offering on the Wii U eShop, with intense action and psychedelic visuals; we gave it a recommendation in our review. The good news for those that want to play this one on the go is that the New 3DS version is close to release, and it could also be a bargain for existing fans. Developer MixedBag games has confirmed that the portable iteration (which is only on the New 3DS, not older models) is coming to North America and Europe in the next two weeks, while it'll also have cross-buy with the Wii U version. Both versions for $7.99 / €7.99 is certainly a good deal, and the developer has also stated that the game runs at 60fps with the 3D effect enabled; considering the gameplay and camera angles in this one it could be rather neat to play in 3D. Are you tempted to pick this one up on New 3DS? Does the cross buy also apply if you already bought in on Wii U? So this is why Reggie announced the Galaxy 3DS. I can't wait I'm so getting it! I read Uridium and instantly get taken back to the late 80's and the awesome game on Commodore 64 and BBC Micro. my 3ds is by far my fav console because it's portable. Another great game to add to the library. I salute the devs for doing this #1 for offering crossbuy and #2 for the 60fps with 3D on this now moves into a must have purchase as far as im concerned. I've been on the fence for a while since the game came out on the Wii U. Now this crossbuy seals the deal! Looking forward to playing it. Already have it on Vita. Don't need it on 3DS. So, good news for the 3DS today, huh. This thursday is gonna be a blast. I'm in. This looks perfect for 3D gaming.